The social network for business professionals, LinkedIn, released a beta version of its Microsoft Outlook add-on Wednesday. LinkedIn Outlook Connector allows you to keep up to date with your LinkedIn connections, integrates their contact information into Outlook, and allows you to add new LinkedIn connections right from your desktop. 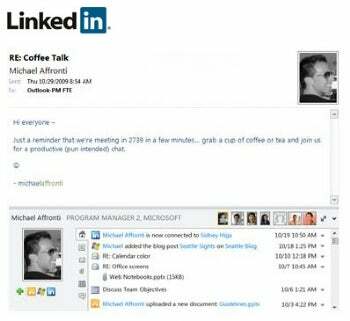 LinkedIn's new add-on capitalizes on Outlook Social Connector, an Office 2010 feature that integrates social networking feeds into Outlook, but not Outlook Express. Right now Social Connector is limited to LinkedIn, but Microsoft says connectors for MySpace, Facebook, and Windows Live are "coming soon". Setting up LinkedIn Outlook Connector in Office 2003 and 2007 is straightforward. Just download Microsoft's Outlook Social Connector, and then install it as you would any other piece of software. Once you've got Outlook Social Connector ready to go, log in to LinkedIn and navigate to linkedin.com/outlook, and install the beta version of LinkedIn's new add-on. Restart Outlook and a configuration wizard will guide you through the set up process. Installing LinkedIn Outlook Connector to work with the beta version of Office 2010 wasn't so easy. Even though Social Connector is standard in Office 2010, the LinkedIn beta add-on is not compatible with the current preview version of Outlook 2010. 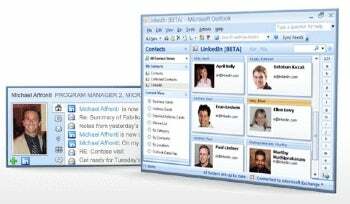 To get LinkedIn functionality to work you'll have to download a free add-on from Microsoft; however, this add-on only works with the 32-bit version of Microsoft Office 2010, and not the 64-bit version or with Office 2010 Home & Business Beta. So if you're using either of these versions of Office 2010, the LinkedIn add-on will not work for you at this time. Once you've downloaded the Outlook Social Connector for Office 2010, you will also have to go through a relatively rigorous set-up procedure that is not for the faint of heart. You can find installation instructions on this page at Microsoft's Website. Any time you open a message in Outlook from someone in your LinkedIn network, you will see LinkedIn information pulled from your connection's profile below the message pane. You can see things like their profile photo, latest status messages, recently added connections and see any recent questions they've asked or answered. LinkedIn Connector will also add a LinkedIn contacts folder where you can you see your network connections' profile photos, e-mail addresses and profile details such as their current job title. In addition to seeing your own LinkedIn connections, you can also discover new ones. Any time you receive e-mail from a LinkedIn member who you are not connected with, an "Add" button will appear below the message pane so you can add them to your network. The LinkedIn connector looks like it could be a helpful add-on to keep tabs on your LinkedIn connections. Look for more social features coming to Outlook in the coming months including Facebook, MySpace and Windows Live.